HomeAbout Us - Who are we and how to reach us! ComputerGear® is passionate about making science, technology, engineering and math (STEM) fun – one T-shirt at a time! Unlike other companies, we started in 1993 as a dare. Back then, when technology and computers were ugly and unfriendly, my husband and engineer geek guy, Mark dared me to do something about it. So I did! We designed 6 ComputerWear T-shirts and took them to a local computer swap for holiday sales and within a couple of years they were in computer stores, bookstores, T-shirt shops, gift stores and mail order catalogs. Customers kept asking for more so we added more related apparel, gadgets, jewelry, books, science kits and opened 4 stores. Then a local bulletin board system (BBS) called and asked us to sell some of our T-shirts “online”. We couldn’t open more stores AND do this new “Internet” thing so we took a leap of faith, closed the stores in 1997 and concentrated on selling online and through our own mail order catalog, ComputerGear & More. Since the beginning we’ve focused on what's important to YOU, our customers -- fast shipping, quality funny T-shirts gifts hand decorated in USA, and USA-based customer service. 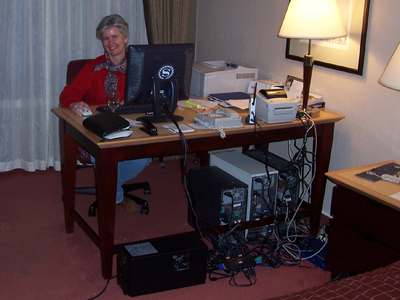 In fact, that’s me in 2006 when western Washington state lost power for a week after a windstorm -- 10 days before Christmas! We moved operations into several Sheraton hotel rooms that had power and kept going, pulling and packing orders with headlamps and flashlights, shipping, and returning customer service phone calls on my cell phone to keep Christmas deliveries on track – without our customers knowing about the hiccup! So drop us a line, pick up the phone, email us at service@computergear.com or post on social and let us know how we're doing!